Kirkstall’s CEO Dr J Malcolm Wilkinson will be attending SOT 2017 where he will be presenting our latest poster: Improved IC-50 Prediction Using the Quasi Vivo® In Vitro Dynamic Cell Culture Flow System. Our poster will be in Hall A in Late-Breaking Poster Session 1, which is on the 16th March from 8.30-11.45am. We would be delighted to talk to you about in vitro toxicology research and our industry leading interconnect flow systems. 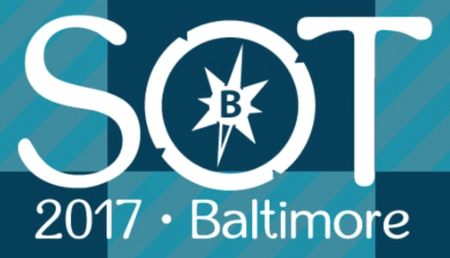 The Society Of Toxicology’s annual meeting is held in Baltimore, USA from the 12th to the 16th March 2017. Approximately 6,500 toxicologists from 50 countries are expected to attend, all discussing the vast topic of toxicology to advance science further and increasing the impact of toxicology. This event attracts a wide range of attendees, including many current or potential Quasi Vivo® users. Quasi Vivo® is well suited to toxicology research due to its ability to culture more metabolically active liver cultures compared to static cultures; and the interconnected flow system allows for cell to cell communication, including passing of cellular metabolites between different cell types. For more detail on liver cultures in Quasi Vivo® and toxicology studies take a look at our liver application note or our published papers.